Apart from the Users settings tool described in Section 4.2, “Managing Users in a Graphical Environment”, which is designed for basic managing of users, you can use command line tools for managing users and groups that are listed in Table 4.1, “Command line utilities for managing users and groups”. id Displays user and group IDs. useradd, usermod, userdel Standard utilities for adding, modifying, and deleting user accounts. groupadd, groupmod, groupdel Standard utilities for adding, modifying, and deleting groups. gpasswd Utility primarily used for modification of group password in the /etc/gshadow file which is used by the newgrp command. pwck, grpck Utilities that can be used for verification of the password, group, and associated shadow files. pwconv, pwunconv Utilities that can be used for the conversion of passwords to shadow passwords, or back from shadow passwords to standard passwords. grpconv, grpunconv Similar to the previous, these utilities can be used for conversion of shadowed information for group accounts. …where options are command-line options as described in Table 4.2, “Common useradd command-line options”. Optionally, you can set a password aging policy. See the Password Security section in the Red Hat Enterprise Linux 7 Security Guide. -c 'comment' comment can be replaced with any string. This option is generally used to specify the full name of a user. -d home_directory Home directory to be used instead of default /home/username/. -e date Date for the account to be disabled in the format YYYY-MM-DD. -f days Number of days after the password expires until the account is disabled. If 0 is specified, the account is disabled immediately after the password expires. If -1 is specified, the account is not disabled after the password expires. -g group_name Group name or group number for the user's default (primary) group. The group must exist prior to being specified here. -G group_list List of additional (supplementary, other than default) group names or group numbers, separated by commas, of which the user is a member. The groups must exist prior to being specified here. -m Create the home directory if it does not exist. -M Do not create the home directory. -N Do not create a user private group for the user. -p password The password encrypted with crypt. -r Create a system account with a UID less than 1000 and without a home directory. -s User's login shell, which defaults to /bin/bash. -u uid User ID for the user, which must be unique and greater than 999. The default range of IDs for system and normal users has been changed in Red Hat Enterprise Linux 7 from earlier releases. Previously, UID 1-499 was used for system users and values above for normal users. The default range for system users is now 1-999. This change might cause problems when migrating to Red Hat Enterprise Linux 7 with existing users having UIDs and GIDs between 500 and 999. The default ranges of UID and GID can be changed in the /etc/login.defs file. A UID greater than 999 is created. Under Red Hat Enterprise Linux 7, UIDs below 1000 are reserved for system use and should not be assigned to users. A GID greater than 999 is created. Under Red Hat Enterprise Linux 7, GIDs below 1000 are reserved for system use and should not be assigned to users. A group with the same name as a user is called a user private group. For more information on user private groups, see Section 4.1.1, “User Private Groups”. At this point, a locked account called juan exists on the system. To activate it, the administrator must next assign a password to the account using the passwd command and, optionally, set password aging guidelines (see the Password Security section in the Red Hat Enterprise Linux 7 Security Guide for details). …where options are command-line options as described in Table 4.3, “Common groupadd command-line options”. -f, --force When used with -g gid and gid already exists, groupadd will choose another unique gid for the group. -g gid Group ID for the group, which must be unique and greater than 999. -K, --key key=value Override /etc/login.defs defaults. -o, --non-unique Allows creating groups with duplicate GID. -p, --password password Use this encrypted password for the new group. -r Create a system group with a GID less than 1000. Use the usermod utility to add an already existing user to an already existing group. Various options of usermod have different impact on user's primary group and on his or her supplementary groups. Note that in this case all previous supplementary groups of the user are replaced by the new group or several new groups. Note that in this case the new group is added to user's current supplementary groups. System administrators usually like to create a group for each major project and assign people to the group when they need to access that project's files. With this traditional scheme, file management is difficult; when someone creates a file, it is associated with the primary group to which they belong. When a single person works on multiple projects, it becomes difficult to associate the right files with the right group. However, with the UPG scheme, groups are automatically assigned to files created within a directory with the setgid bit set. The setgid bit makes managing group projects that share a common directory very simple because any files a user creates within the directory are owned by the group that owns the directory. When a process creates a file, the file has certain default permissions, for example, -rw-rw-r--. 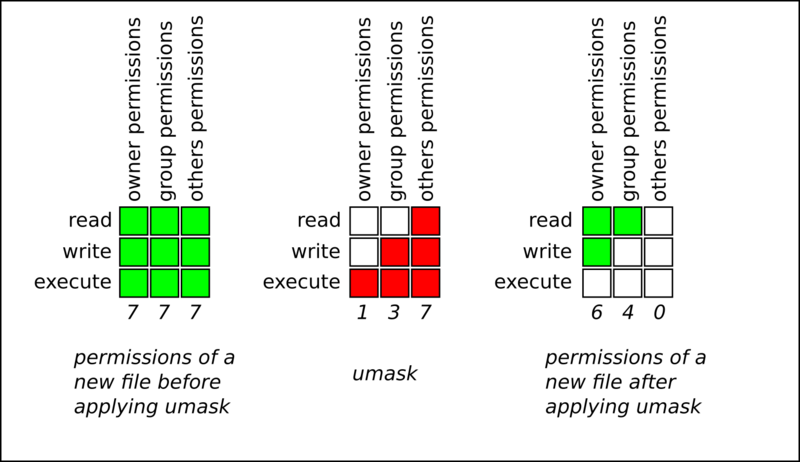 These initial permissions are partially defined by the file mode creation mask, also called file permission mask or umask. Every process has its own umask, for example, bash has umask 0022 by default. Process umask can be changed. Umasks can be represented in binary, octal, or symbolic notation. For example, the octal representation 0137 equals symbolic representation u=rw-,g=r--,o=---. Symbolic notation specification is the reverse of the octal notation specification: it shows the allowed permissions, not the prohibited permissions. When a bit is set in umask, it is unset in the file. When a bit is not set in umask, it can be set in the file, depending on other factors. The following figure shows how umask 0137 affects creating a new file. [john@server tmp]$ ls -lh . For popular shells, such as bash, ksh, zsh and tcsh, umask is managed using the umask shell builtin. Processes started from shell inherit its umask. Substitute octal_mask with four or less digits from 0 to 7. When three or less digits are provided, permissions are set as if the command contained leading zeros. For example, umask 7 translates to 0007. By default, bash umask of a new user defaults to the one defined in /etc/bashrc.